Dimplex FX20IPX4 Fan Heater - John Cribb & Sons Ltd, UK Electrical Distributors, Dorset, Hampshire, Wiltshire, Somerset & the Isle of Wight. IPX4 rated for unrivalled installation versatility. Designed for high level mounting. Ideal for bathrooms, ensuites or kitchens. 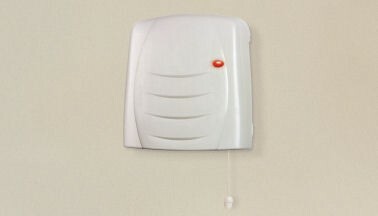 This item has been discontinued and has been replaced by Dimplex FX20EIPX4 2.0kW Down Flow Heater Fan comes with Pull Cord & Timer IPX4, Lot 20 Compliant. The FX20IPX4 and FX20EIPX4 with an innovative patented* design and latest technology to provide an IPX4 rated fan heater for unrivalled versatility when it comes to installation. This unique feature allows greater installation flexibility in bathroom locations. Combined with a sleek, modern look, the IPX4 rated FX downflow heaters provide an ideal heating solution for almost any bathroom, en suite or kitchen.